NBC News correspondent Tom Costello has been using the “Meet the Press” set in Washington, D.C. as home base for his reporting on Flight 370 across the network’s platforms. The setup has appeared on “NBC Nightly News,” MSNBC and the “Today Show,” as shown in the image above. The studio’s large rear projection screens are used to display branded graphics as well as map imagery. 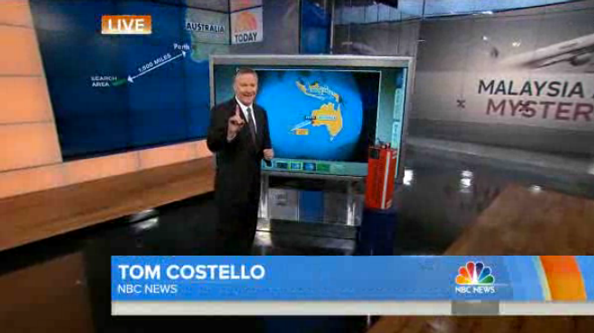 A freestand touchscreen allows Costello to interact with maps and graphics, while a small pedestal is used to display a “black box,” which is actually a bright orange-red, replica. In some cases, a tight shot framing only the screen and black box is used, while in others, a wide shot that gently zooms in to Costello is chosen.